Maintenance Therapy webinar has been updated based on more recent court rulings. Therapists are all aware of the JIMMO vs. Sebelius ruling that debunked the “improvement standard” for therapy services and provided for skilled maintenance therapy. Confusion, however, reigns among therapists on what is covered, how to provide skilled maintenance services, how long can it be used and how to document to support the services. Unfortunately, medical review for compliance with billing as well as documentation requirements is an ever-growing concern for health care providers. A key element of medical review of maintenance therapy is establishing not only medical necessity but that the specialized skills, judgement and knowledge of a therapist were needed to provide the services. Skilled maintenance therapy can be an effective tool to support our patient’s ability to achieve and maintain their highest level of function. 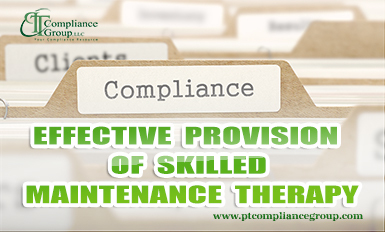 It is therefore essential that we understand the regulations surrounding skilled maintenance therapy, how to effectively provide these services to improve our patient care, and how to document these services to insure appropriate care for our patients and reimbursement for our services.